U.K. retailer Game is testing a new program that will let customers put pre-orders on pre-owned games. The fat margins on pre-owned game sales make it a big part of a healthy retail diet, but even so the idea of pre-ordering pre-owned games seems a little excessive to me. If you want a game badly enough to pre-order at all, then isn't it likely that you're willing to lay down a few extra bucks to get on on launch day and not a week later? I guess we'll find out soon enough thanks to the gang at Game, which is now offering pre-owned pre-orders on major unreleased titles like Dragon Age 2, Homefront, WWE All-Stars and Crysis 2. The pre-owned pre-order process seems to be the same as regular pre-orders, with two big differences: you'll save a few bucks and you'll have to wait a week longer to get it. 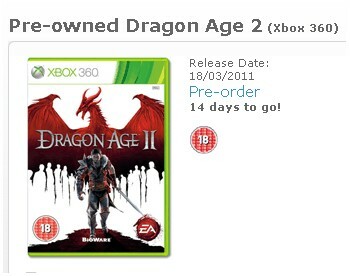 The regular release of Dragon Age 2, for instance, comes out on March 11 and sells for Â£38.99 (roughly $63) with the Fadeshear and Lion of Orlais pre-order bonus items; a pre-owned copy, on the other hand, will run you Â£33.99 (about $55) without the bonus items and won't be available until March 18. It strikes me as a bit ill-conceived, at least from the perspective of the customer. Gamers who make a habit of pre-ordering games aren't going to give up items and sit on their hands for an extra week just to save a lousy eight bucks. It's just not enough incentive, especially given the trend toward "online passes," which typically cost more to purchase separately than the pre-owned savings. Call me crazy if you will, but I can't see this one working.